The Kats from AMT proudly present a 1/25 scale plastic kit version Mattels infamous Tom Mongoose McEwen Hot Wheels wedge dragster! Featuring authentic decals and super-detailed parts! All new tooling provides the multi-piece body and optional exit-below-body header with body hole-cover option. Even better, it comes molded in two colors for less painting! A deep blue-tinted crescent windscreen and wide pad-printed drag slicks put the finish-line touch on this fabulous fueler! New-tool multi-piece body molded in pearl blue. Other parts molded in black / blue-tinted windscreen. Super-detailed chassis / many gleaming chrome parts. Skill Level: 2 (ages 10+). DUE TO SMALL PARTS THAT MAY BE SWALLOWED KEEP AWAY FROM CHILDREN AGE 3 AND YOUNGER. Go to our Multiple Item Orders. Page for step by step instructions. We are sure we can work out any issues that might come up. Thank you in advance for your feedback! We do not mark merchandise values below value or mark items as "gifts", US and International government regulations prohibit such behavior. 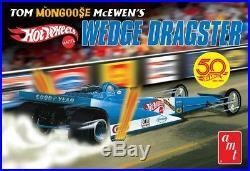 The item "AMT 1/25 Tom Mongoose Fantasy Wedge Dragster Model Kit AMT1069" is in sale since Wednesday, December 27, 2017. This item is in the category "Toys & Hobbies\Models & Kits\Automotive\Hot Rod". The seller is "mth-hobby" and is located in Saint Charles, Missouri.